Our graduate recruitment solutions have been specifically designed to take the strain out of your graduate recruitment process. We use a range of psychometrically rigorous and fully flexible tools, to help you sift through large volumes of graduates, enabling you to find the best talent and the most suitable applicants for the role. Use our cutting edge personality questionnaires to find and identify only the best fit candidates for the role. Enable recruiters to sort their applicants by potential to do the job, rather than just on academic performance. We work with clients to develop bespoke Situational Judgement Tests that mirror the tasks your retail staff will face in their day-to-day job. Did you know, companies who don’t utilise any form of onboarding often fail to retain up to 50% of new employees. 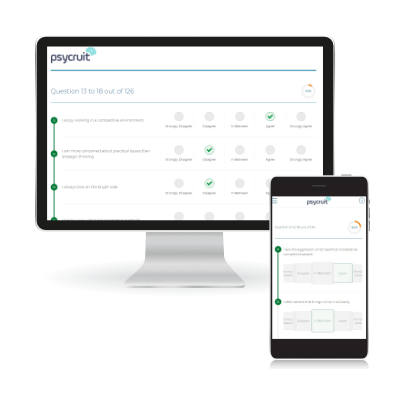 Why Use Psychometrics in Graduate Recruitment? Bespoke assessment solutions that are fully branded to your company and accessible on any device, meaning attracting tech savvy graduates is now a piece of cake. The rapid growth in mobile technology and the internet has done more than just change the recruitment industry; it has fundamentally changed the way graduates think about employment. This means you can no longer rely on the old methods of recruitment to find the best graduates. To have any chance of success, you must leverage the power of mobile digital technology, utilise big data, and be innovative enough to be able to recruit the best possible graduates for the job. Graduate schemes have one of the highest rates of staff turnover in the recruitment industry, with up to a quarter of them leaving within the first year. Therefore finding and then hiring quality graduates is only part of the equation. Organisations who retain the highest level of graduates are those that invest the most in them. After all the time and effort spent on acquiring them, retaining your best graduates is now a key element in your overall success as a recruiter. “With 2000 applications to ‘hand-screen’ we were faced with a real resource problem."